Named for luthier Bob Taylor, who was just 19 years old at the founding of the company with business partner Kurt Listug, Taylor Guitars has been producing acoustic and semi-hollow electric guitars since 1974. It has since grown to become one of the largest manufacturers of acoustic guitars in the USA. Taylor Guitars are made in a 145,000 square foot manufacturing facility at their headquarters in El Cajon, California (open to the public daily for guided tours), with a second premises in nearby Tecate, Mexico, where their lower-cost models are created. They employ over 550 workers and build nearly 500 guitars per day. Taylor was recently awarded a U.S State Department Award for Corporate Excellence, citing its responsible practices in obtaining ebony for its guitars. Renowned for their bright tone and popular for their smooth NT bolt-on neck system, Taylor Guitars are preferred by artists such as Dave Matthews, Jason Mraz, Taylor Swift, Prince and Zac Brown. The Taylor ES (“Expression System”) pickup system found in many models utilises a neck-mounted humbucking induction pickup and a pair of dynamic soundboard transducers mounted by the bridge and lower on the soundboard. These run to a Rupert Neve-designed pre-amplifier, offering reliably clear and expressive electro-acoustic tone. The all-arounder by Taylor. The acoustic/electric Grand Auditorium 414ce responds well to an array of playing styles thanks to Taylorâs proprietary body shape and the expansive tonal palette of ovangkol and spruce. Expect a blend of power and tonal definition, especially in the midrange, so whether you like to strum, flatpick or play fingerstyle, the 414ce makes a great playing partner. Contemporary aesthetic strokes include white binding, Italian acrylic dot fretboard inlays, a three-ring rosette, and a full-gloss body. 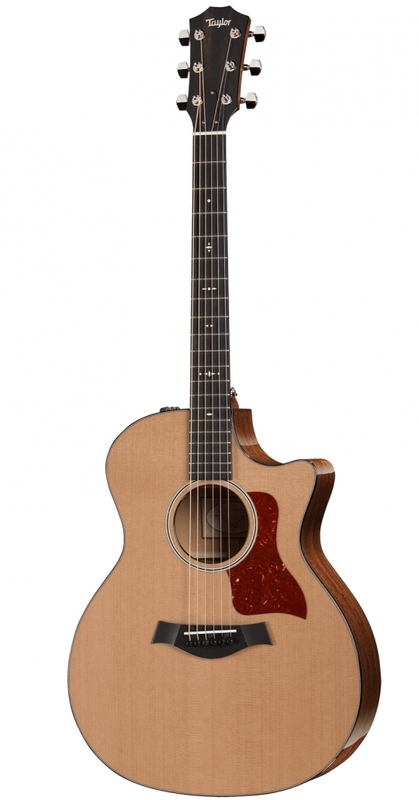 The guitar comes equipped with Taylorâs Expression SystemÂ® 2 acoustic electronics along with a Venetian cutaway, and ships in a Taylor deluxe hardshell case. Taylor on a budget. The distinctive 200 Series Deluxe category is loaded with high-end performance appeal.A smooth sunburst adds vintage flair to the solid Sitka spruce top on this layered rosewood Grand Auditorium. Deluxe features include a full-gloss body, Expression System 2 pickup and preamp, a Small Diamond fretboard inlay, and a standard hardshell case.Whether youâre a beginner or a pro player, Taylorâs balanced tone and superb intonation will help you sound your best. One of the most appreciated Taylor guitars around. 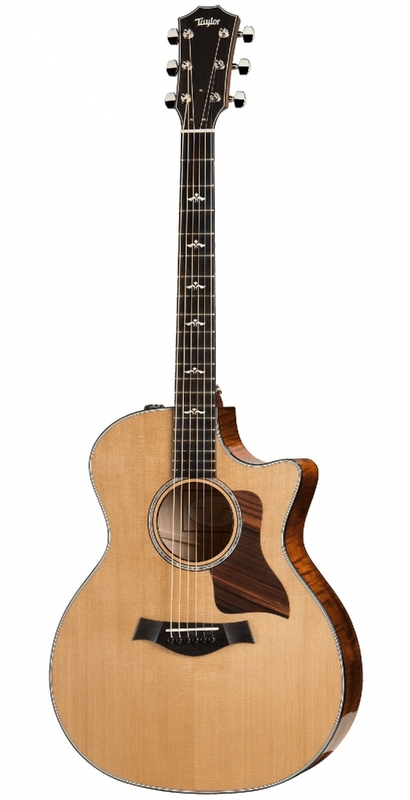 Taylorâs popular 814ce offers players the ultimate all-purpose guitar. Its balance, warmth and articulation are great for fingerstyle, it has enough punch as a strummer to front a band, and the top-end power will fuel lead runs without getting shrill. Itâs a great choice for a gigging player looking for one guitar that can cover it all. The revoicing of the 800 Series has brought greater warmth, a more mature midrange, and a looser, more luxurious low end to the 814ce, thanks in part to the customized bracing and a new, custom-calibrated Elixir HD Light string-gauge set. Premium appointments include maple binding and back strip, rosewood top edge trim, a rosewood pickguard, Taylorâs new Element fretboard inlay in mother-of-pearl, a marbled fretboard, and new Expression System 2 acoustic electronics. The guitar features a Venetian cutaway and includes a Taylor deluxe hardshell case. Small size, big sound! The GS Mini series by Taylor is known for its small size - big sound.Creating a small guitar that sounds much like a standard size one is not easy, but Taylor really did it.It's a full sounding guitar, with tight lows and nice highs, which not only can be used as a travel guitar but just as an any normal one, on stage or in the studio.With the GS Mini-e Koa, you're not only getting a great sounding portable guitar, but also a beautiful one. Entry level Taylor sound. 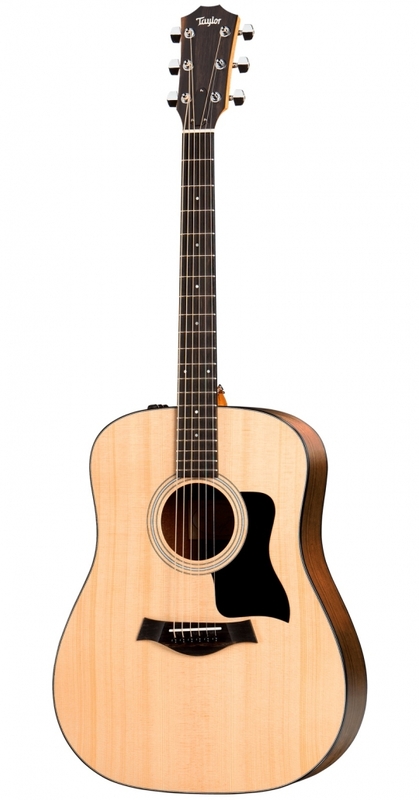 With layered Walnut body, Sitka Spruce top, Sapele neck and Ebony fingerboard, the Taylor 110e dreadnought is a great and affordable purchase for those who seek to buy a Taylor guitar below 1000$. The 16" / 40.5cm wide, non cutaway dreadnought body projects a full and punchy sound which fits well for strumming and pick playing. 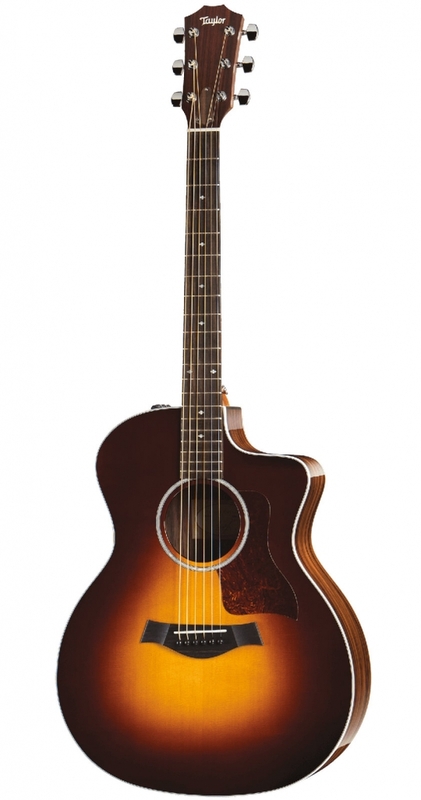 Most evident are the mid and high tones on the Taylor 110e, it is an open sounding guitar. This model is equipped with Taylor's Expression System 2 onboard pickup, which offers treble, bass and volume controls. The Expression System 2 features three uniquely positioned and individually calibrated pickup sensors. With this design, Taylor aims to capture more of the dynamic range of the guitar. Entry level Taylor sound. 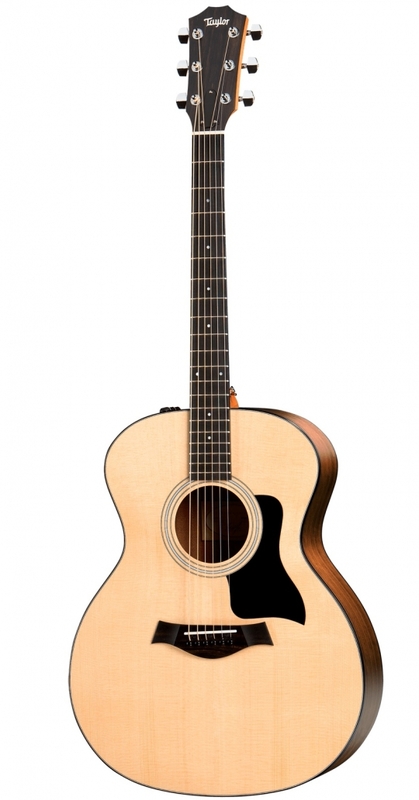 With layered Walnut body, Sitka Spruce top, Sapele neck and Ebony fingerboard, the Taylor 114e Grand Auditorium is a great and affordable purchase for those who seek to buy a Taylor guitar below 1000$. We think that the 114e, alongside the 114ce, is the all-arounder guitar of the 100 series. The 16" / 40.5cm wide, non cutaway grand auditorium body is easy to work with and projects a clear and open sound, great for fingerstyle as well as pick playing. 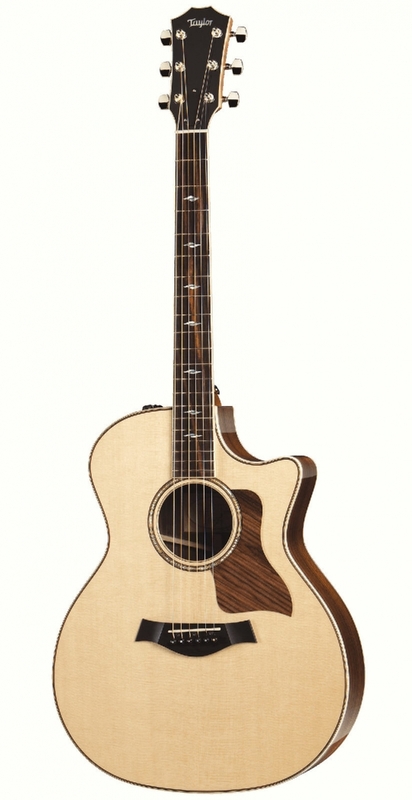 The Taylor 114e is a great choice for band playing as it comes with Taylor's Expression System 2 onboard pickup. The Expression System 2 features three uniquely positioned and individually calibrated pickup sensors. 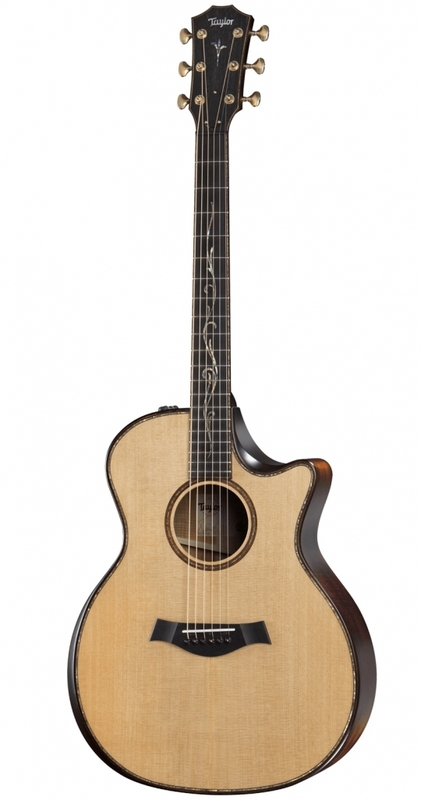 With this design, Taylor aims to capture more of the dynamic range of the guitar. If you tend to play a lot above the 12th fret we recommend checking the Taylor 114ce out as it is essentially the same guitar only with a cutaway. A Stunning Builder's Edition by Taylor Guitars. The K14 Builder's Edition is a Koa masterpiece guitar. 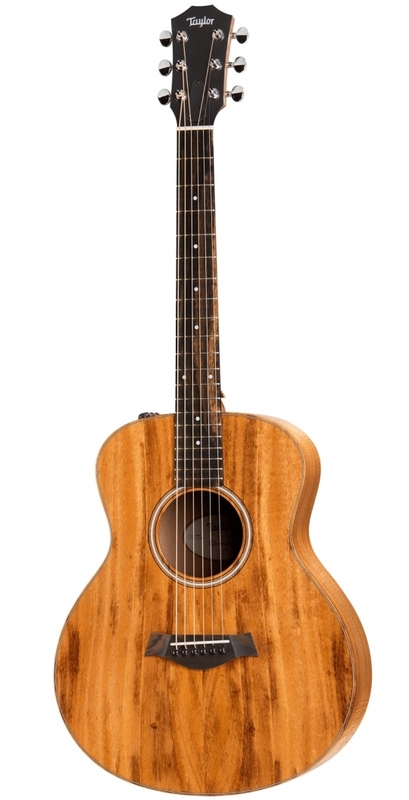 The Hawaiian Koa and torrefied Sitka Spruce work so well sound wise and look wise. Thanks to Taylor's V-Class bracing, this guitar projects loud and even volume, tons of sustain and harmonic sound. One of Taylor's main goals in their Builder's Edition, is creating extra comfortable guitars which can be played for hours. Therefore a beveled arm rest and a reshaped cutaway that flows smoothly into the heel and incorporates a finger bevel were added to the K14. The K14 Builder's Edition does not only sound superb unplugged, thanks to the Expression System 2, this beautiful guitar is perfect for performing musicians too. Fantastic for the traveler. The Baby Taylorâs super-sized sibling responds with a full-size sound. 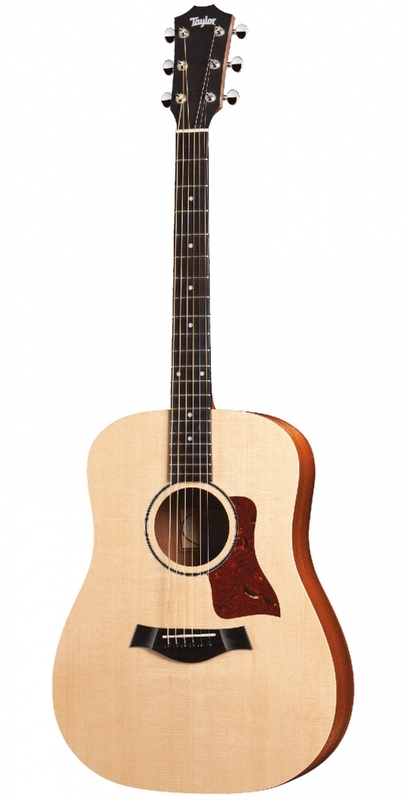 The 15/16-scale Dreadnought features layered sapele back and sides with a solid Sitka spruce top, making it a handy and affordable songwriting partner for anyone. The guitar comes with a gig bag for easy portability. When Taylor goes Maple. The Grand Auditorium has always been a versatile performer, and this edition boasts an array of tone-enhancing refinements that transform mapleâs tone profile into a richer, warmer and more complex voice. As a result, players can expect an even more dynamic and expressive musical tool. Design nuances include a maple-specific back bracing profile and a special seasoning process for the spruce top called torrefaction, a method of roasting the wood to produce an aged tonal character with greater acoustic resonance and responsiveness. Other touches include the use of protein glues to optimize the tonal transfer between key wood components and an ultra-thin, 3.5-mil gloss finish to minimize dampening. A new, hand-rubbed âBrown Sugarâ stain on the back and sides gives mapleâs striking figure a beautiful violin-hued appearance without adding extra thickness to the finish. Featured appointments include ivoroid Wings fretboard inlays, an inlaid ebony backstrap, ebony binding with ivoroid purfling, an ebony/ivoroid rosette, and a striped ebony pickguard, along with Taylorâs Expression SystemÂ® 2 acoustic electronics. The guitar comes with a deluxe hardshell case. Great performers guitar. The 500 series by Taylor is a one great series in our opinion.Taylor used for this series tropical solid Mahogany for the back and sides, solid western red Cedar and Taylor's performance bracing.All of this with combination of the 514ce's grand auditorium body shape results in a loud, resonant guitar, with strong mid range characteristics which fits well to the solo performing musician.It is a well built instrument, a smooth player with solid looks. We like it!